VidiU, developed by Teradek, which has broad capabilities for online broadcasts without using a computer. 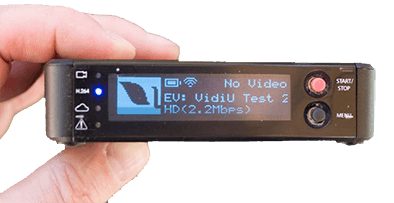 VidiU device allows you to capture and transmit video streams from different sources in high definition in real time. It is possible to send the encoded stream to the server via a wireless connection. VidiU has application programming interface (API) for integration with popular services like broadcasts YouTube Live, Ustream and so. VidiU can easily send multimedia streams to different media servers (eg, Wowza Streaming Engine), or CDN protocol RTMP. Company Teratek and Wowza Media Systems is constantly working to ensure that their hardware and software solutions worked very well together, so if you are using Wowza Streaming Engine , make sure you take a look at VidiU, as to a device that you can use as a hardware video encoder. Built-in lithium battery provides VidiU battery life of up to 60 minutes. VidiU offers free apps for iOS and Android devices, with which you can monitor the current broadcast in real time. VidiU also works as a wireless access point, so it can be accessed directly for example, using a tablet or smartphone. VidiU has an HDMI interface to connect video sources with a resolution of HD (up to 1080p). Encodes the video in real-time codec H.264, and audio codec AAC. Bit rate generated flux – to 5 Mbit / s. Also VidiU on the body has headphone and mic / line input for sound. Source resolution: 1080i, 1080p, 720p, 576i / p, 480i /p. For more information about the device VidiU, can be found at the link Teradek VidiU.